The world’s fastest Vauxhall will make a star appearance at the VXR Power Festival, to be held at Silverstone Circuit in Northamptonshire this Bank Holiday, August 28-29. Packing over 3000 horsepower from its 8.8-litre, twin-turbocharged GM V8 engine, ‘Red Victor 3’ – a highly modified version of Vauxhall’s original 1967 Victor FD – will appear at the Power Festival to herald a new partnership between Vauxhall’s VXR brand and the Red Victor team for the 2011 MSA Pro-Modified Drag Racing season, with a car that is still street legal. Yes, that’s right: street legal. 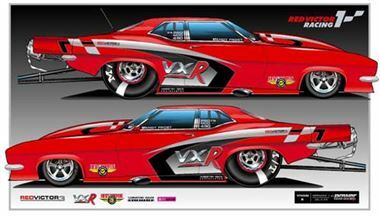 While the car is still in development, the Red Victor team is predicting a top speed, to begin with, of 240mph in the quarter-mile, which it should achieve in 6.5 seconds. And there’s no reason to doubt them: their last project, Red Victor 2, was capable of nearly 200mph in the quarter-mile and 0-153mph in 4.8 seconds. Vauxhall’s VXR Power Events, which has run through 2010 to raise money for Help for Heroes, reaches its zenith with the two-day Power Festival at Silverstone this Bank Holiday. Thousands are expected to attend the event, which aims to raise further funds for H4H through high-octane activities like 0-60 challenges, autotesting, karting and VXR track tuition with pro-drivers. VXR and Vauxhall V8 owners can even pay to take to Silverstone’s famous track in their own cars. But if you’d rather just sit back and watch the action, don’t miss the Pro-Am Pursuit, in which famous racing drivers from Vauxhall’s past, like Fabrizio Giovanardi, Jason Plato and James Thompson take on celebrities such as TV chef, James Martin, ex-England footballer, Luther Blisset and Eastenders’ Kara Tointon. And if that isn’t enough, then Paul Swift will be there to perform some unbelievable stunts in a Vauxhall road car. What the VXR Power Festival won’t do is cost you the earth. With adult tickets costing just £10 and children under five entering for free, the whole family can enjoy an action-packed day without breaking the bank. Even the on-site challenges only cost between £5-10, with all proceeds going to one of the UK’s most worthy causes.